Excellent sauces, made with quality ingredients and above all, made from delicious recipes. Aliments SiBon Foods has been doing this for many years now, and by launching KITCHEN LAB, the challenge was to reduce food waste by using ugly vegetables to make new sauces. In fact, nearly half of the vegetables produced in the world are discarded rather than consumed, while these products are still very good for consumption. They are rejected either because their shape, size or color do not meet the beauty criteria given by the industry. The idea seemed simple and that is why KITCHEN LAB has been sourcing since 2015, vegetables set aside by the food industry by transforming them into delicious sauces for pasta, rice, couscous, meats, fish or seafood. The first time we had our customers taste our KITCHEN LAB sauces, we were given a smile. The same thing inevitably happens every time a new customer is conquered by tasting our exquisite and original sauces. We first started in Metro grocery stores and a little over a year later we were also in IGA grocery stores and several independent stores. We are now working hard to export out of Quebec. We cannot wait to share the KITCHEN LAB experience with the world! 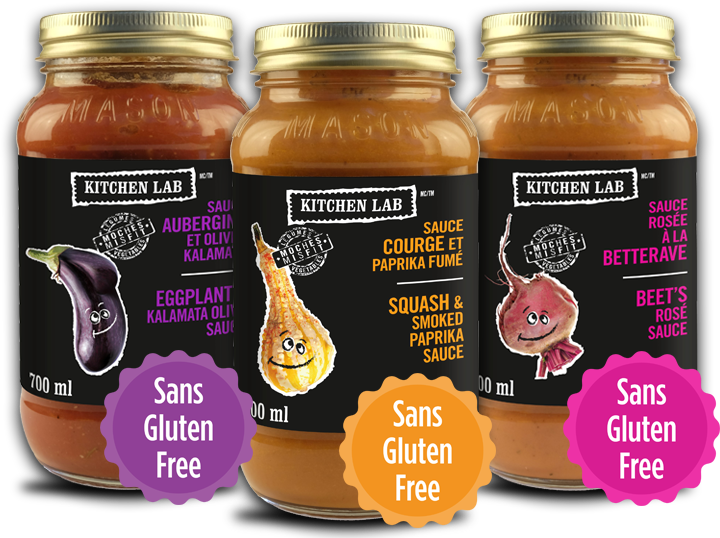 Today, in addition to our ugly vegetable sauces we have launched six new gourmet sauces; meat sauces, extra-meat, smoked meat, rosée, vegan tofu and vegan tomato-basil. KITCHEN LAB’s mission is to be innovative and to join the foodie in you! In order to contribute in reducing food waste, we use misfit vegetables to produce our sauces. These misfit vegetables would have been thrown away otherwise. They are actually as good and fresh as regular vegetables but their shapes make them unsellable. Look how cute they are! 27 billion $ of food waste in Canada every year! Launch of six new gourmet sauces; meat, extra meat, creamy dew, vegan tomato-basil and vegan tofu.